Ventilation fans are a vital asset to keep harmful gases and fumes, dust, heat and other factors from creating a dangerous working environment. Proper ventilation systems will not only create a more comfortable and safer working environment, but also improve employee efficiency, reduce the incidence of illness and heat exhaustion, and reduce costs associated with cooling systems. Ventilation systems will also reduce dust and debris collecting on finishing products, machinery and other systems. Dynamic Fan gives you a selection of ventilation fans to choose from, including different sizes, designs, speeds and configurations. Dynamic Fan can help you select the most efficient fan for your facility, the particles, heat or fumes you are expelling, intake levels, placement and more. 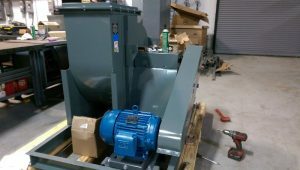 We’re also readily available to perform routine maintenance to make sure you maximize the life and value of your fan, and if your fan is in need of a replacement part, we can sell and install a new motor, bearing, shaft, pulley or belt. Take a look at the industrial fans available for large facilities, small businesses and enterprises of all types, and do not hesitate to contact us with any questions you may have.